This Dar Rehan polished chrome 3 light semi flush fitting features rippled glass shades and wire decoration. 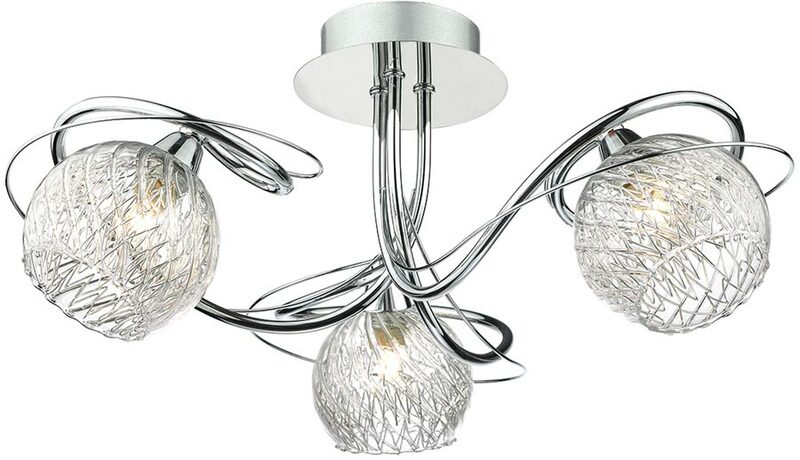 A sparkling ceiling light, with polished chrome mount and three swirling arms and wire decoration. Each arm holds a downward facing clear rippled glass shade for a sparkly light. A modern, compact ceiling fitting that takes three dimmable G9 lamps set within delicate glass shades to create a beautiful lighting effect. This fitting gives out a great sparkle and is ideal lighting for rooms with a low ceiling. There is a larger matching five light semi flush available in the Rehan lighting range that can be viewed below. Dar is widely recognised as one of the leading suppliers of a full range of innovative, quality lighting products such as the Rehan polished chrome 3 light semi flush fitting you see here.